Presented here is what many investors believe to be the crowning achievement to the finest modern day portfolio. 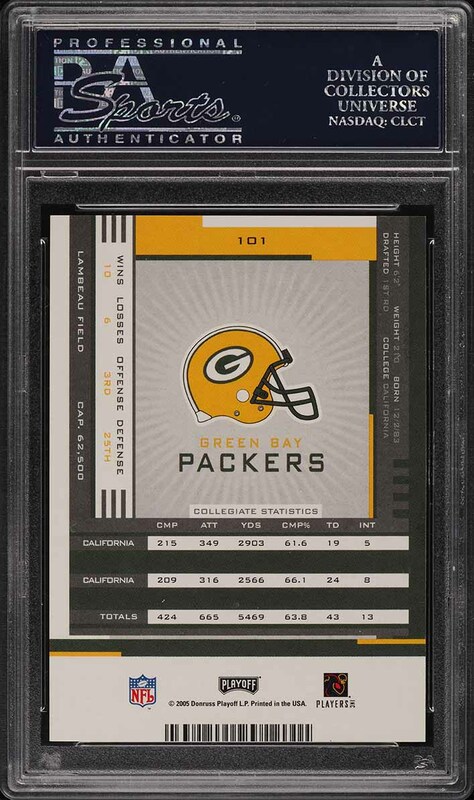 The '05 Playoff Contenders Rodgers rookie is a dream card for many and is incredibly tough to acquire in PSA 10. With only thirty seven copies ever awarded the illustrious designation, this card is far too rare to ever satisfy the demand. Exhibits pack fresh eye appeal with four keen corners and uncirculated edges. Perfectly centered with clean borders and precise registration. The surfaces are mesmerizing with zero indentations or imperfections presents; a rare quality for the sensitive foil surface. In addition, the color is bright and the clarity is superb. The autograph is boldly struck in black ink and shows extremely well for the issue. Arguably the all-time greatest and most efficient passers to ever play with a QBR of 103.1; nearly three points better than any other QB in history. 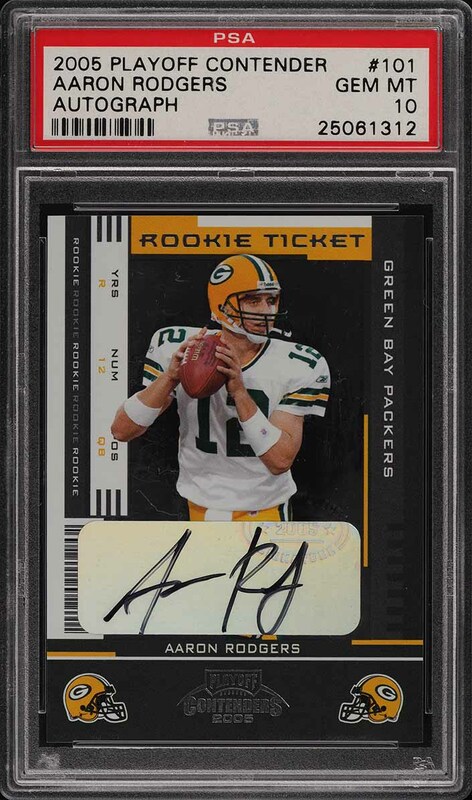 This is a vastly under valued rookie card when you compare it to the likes of Brady Playoff Contenders PSA 10s and should be heavily pursued as he approaches the HOF. Comes highly recommended by PWCC. One of nearly 15,000 cards, lots, and sets up for bid in our 4th Auction of 2019. Click on the link above to view the other PWCC auction lots. The PWCC Vault is now live! Open a PWCC Vault account and receive a custom Vault shipping address. Purchases shipped to the Vault receive free shipping and reflect Oregon's 0% sales tax rate.